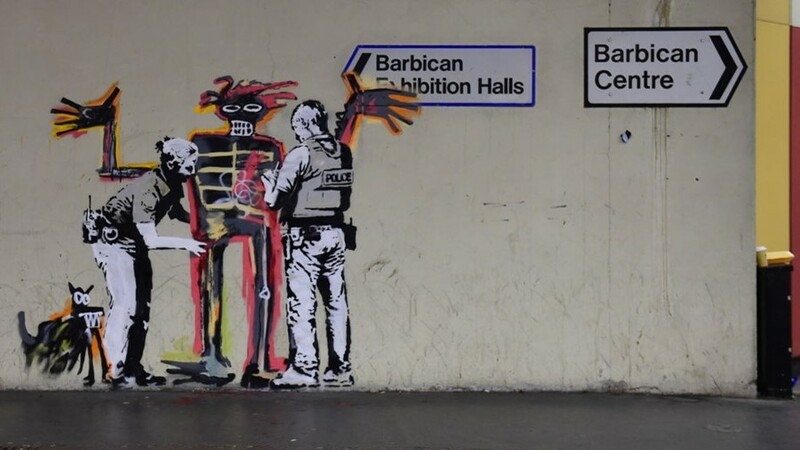 Two new Banksy murals have appeared at the Barbican in London over the weekend. The pieces are an “unofficial collaboration” paying homage to Jean-Michel Basquiat and have appeared just days before Britain's first ever Basquiat retrospective opening at the Barbican on September 20. September has been a busy month for Bansky. The Basquiat murals follow on from Banksy’s most recent piece found at an anti-arms race exhibition, Art the Arms Fair, set up to fight against the world's largest arms expo held in east London earlier this month. While Basquiat is enjoying a renaissance having just broken a record when his “Untitled” painting sold for $110.5 million. Returning to Basquiat’s graffitist roots, Banksy’s piece features a Ferris-wheel and a note from the artist: “Major new Basquiat show opens at the Barbican – a place that is normally very keen to clean any graffiti from its walls.” The second mural depicts an image reminiscent of Basquiat’s 1982 Boy and Dog in a Johnnypump being stopped and searched by police.